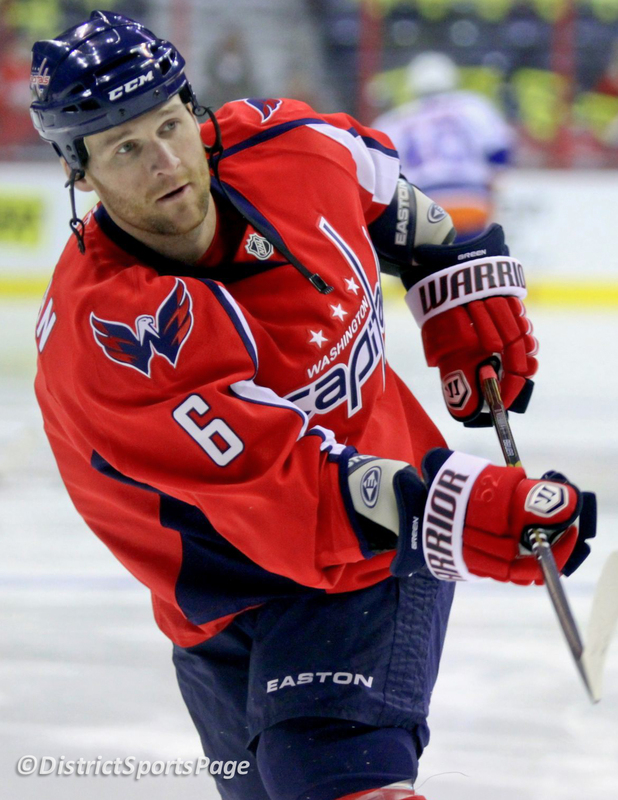 The Washington Capitals started strong and took a 2-0 lead over the visiting New Jersey Devils with goals by Troy Brouwer and Jason Chimera. And then they stopped shooting. As the Caps did in the first period, the Devils scored two goals in the second. The game went to a four-round shootout and the Devils won 3-2. The shot totals were extremely low with Caps at seventeen and Devils at nineteen. A combined total of thirty-six shots for sixty-five minutes of play. The Capitals fired off nine shots in the first period and then only eight over the next forty-five minutes. It is pretty tough to score goals without shooting. Alan May also wanted to see more shooting. Playing back-to-back nights takes a toll, especially when the blue line is down by two key players. Mike Green and John Erskine were scratched. Head Coach Bruce Boudreau said the decision to put Brooks Laich on the blue line instead of a call-up was because Laich has done it and Bruce didn’t know till 5:50 that Erskine was out (with an undisclosed ailment and is now day-to-day). Green had just returned to ice on Friday night and was roughed up a bit. To make matters worse for the D-Men, Roman Hamrlik received a cross-check during the game and is listed as day-to-day. Hamrlik only took three shifts in the second period and it is unclear how he was injured, however, he didn’t play in the third period or overtime. Dennis Wideman gets my vote for MVP of the home-and-home series. With a depleted blue line, Wideman stepped it up and skated 27:11 in Friday’s game, which is the most ice time logged by any Caps played this season, followed up by a staggering 33:52 in Saturday’s game. “I was starting to get a little tuckered at the end, but I think that when stuff like that happens when there’s injuries you just have to try to not push it too much, try not to get out of position, try not to get caught and conserve where you can,” said the Ironman Wideman. Michael Neuvirth was in goal for the Caps and said after the game, “I was feeling pretty good, and I think the whole team was feeling pretty good.” Neuvy stayed sharp throughout the game, which is a challenge with low number of shots. Shootout: Capitals shot first with Matt Hendricks, Alex Ovechkin, Alexander Semin and Nicklas Backstrom. Ovi beat Johan Hedberg through the five-hole. For those keeping track, the hooded played in the pre-game video was Matt Hendricks. Tonight’s attendance was 18,506, the Capitals 114th consecutive sellout at Verizon Center. The Capitals have an off day tomorrow and will return to the ice on Monday, Nov. 14 at 10:30 a.m. at Kettler Capitals Iceplex. The new Caps Courage hats and t-shirts went on sale today and were a big hit. Caps honored veterans in a special video tribute one day after Veteran’s Day which received a standing ovation from fans.